Safety leaders need to be able to speak the language of upper management and relate to workers. Safety professionals facing job insecurity say gaining additional skills and certifications may improve their odds of getting a new job. If current trends hold steady, the number of occupational safety and health jobs will outpace the number of trained professionals to fill them, according to NIOSH. In a report issued last year, the agency warned of an upcoming shortage and highlighted additional skills employers wanted from new safety graduates. Leadership and communication topped the list. 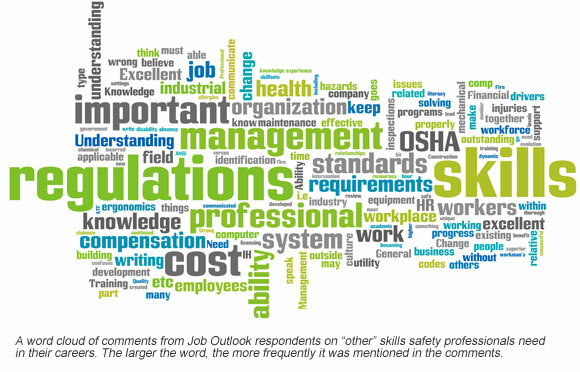 Mastering those areas is crucial for experienced, as well as new, safety professionals, suggests findings from Safety+Health’s annual Job Outlook survey. The survey, conducted in May, was sent to 14,950 subscribers – 1,292 of whom responded for a response rate of 8.6 percent. Asked to rank nine skills that safety professionals need in addition to industry-specific expertise, most respondents put communication with upper management, communication with workers/training, and leadership in the top three – an indication of both the importance and interrelatedness of those skill sets. 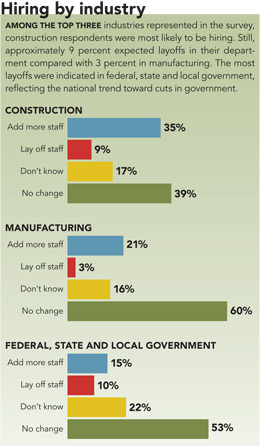 Consistent with last year, 87 percent of respondents consider their job “very stable” or “relatively stable.” Almost half of respondents work in manufacturing or construction, and more than one-third are managers. Regarding staffing, 23 percent have recently added staff to their department; one-quarter plan to hire in the next 12 months. Looking down the road, the Bureau of Labor Statistics predicts that jobs for occupational safety and health specialists will grow at 9 percent (which is slower than average) through 2020, compared with 13 percent for occupational safety and health technicians. BLS identified communication as an important quality for both groups, which lines up with survey responses. Tom Schneid, director/chair of the graduate division of safety, security and emergency management at Eastern Kentucky University in Richmond, explained how communication functions on multiple levels. “I think critical and creative thinking is absolutely essential, and the ability to communicate with upper management to be able to justify your program, with middle management because those are the people you’re working with every day to get it done, and with your hourly workforce to integrate your programs and get them working on the shop floor,” he said. In the pages that follow, survey respondents discuss their experience with communication and leadership and reflect on their personal career outlook. When making the pitch to upper management, Patrick Genovese, risk management coordinator for DuPage County, IL, focuses on the financial impact. Genovese believes safety professionals also need public speaking skills to address large groups, although they should not do all the talking during day-to-day interactions with workers. “Being a good listener is very, very important, and being able to be a good investigator – to have your eyes and ears open all the time,” he added. Stephen Frost, quality/environmental health and safety coordinator at Jupiter, FL-based PSM, which makes aftermarket gas turbines, said both upper management and workers want to prevent injuries, but management may not realize its message is coming across as “get it done regardless of safety,” and workers may need education on identifying hazards. Reaching workers requires being sincere and relatable, several respondents told S+H. Ken Whittle, safety/facility manager for an equipment distributor in Fort Worth, TX, recommended building a friendly and easygoing rapport with workers. “I think when they see that you’re trying to partner with them, you’re going to get a lot further than if you try to cite regulation and code,” he said. Whittle’s job involves traveling to different distribution centers, and one approach he uses is to engage workers about their interests outside of work. He said warehouse workers may be put off by his business attire, but he dispels preconceived notions by sharing that he races off-road dirt bikes – something they do not expect to hear from a safety professional. That type of conversation “helps people see you now as a real person that they can have a real conversation with,” he said. An important part of communication with workers is following up. If employees raise concerns but never hear back, they will stop reporting, according to Scott Mendelson, director of environmental health and safety at DZ Atlantic, a maintenance firm headquartered in Philadelphia. Hazard reports at DZ Atlantic are posted in a log that includes the person responsible for correcting it and the anticipated completion date. Mendelson said the benefit is twofold: Employees are involved in the safety process and can hold their supervisor accountable. Many of the qualities mentioned for effective communication also apply to safety leadership. Jim Peck Jr., environmental health and safety manager at Hawaii Marine Cleaning in Pearl City, said leaders have to “genuinely care about people.” Being a leader, he noted, is different from being a manager. The challenge for safety professionals is that they operate on a continuum between trust and fear, which Peck compared to a seesaw – when trust is high, fear is low, and vice versa. Employee trust is crucial, but must be earned and is easily lost, he said. He considers being able to relate to workers on the shop floor “one of the key fundamentals of having a safety program” – and other respondents agree. Life was not supposed to go this way. A site safety manager* in construction told Safety+Health that he worries he will soon be out of work after 27 years in the safety field and almost a decade with his present employer. His employer was taken over by another company in 2010, and the construction industry as a whole has taken a hit. “There’s a great deal of fear,” he said. 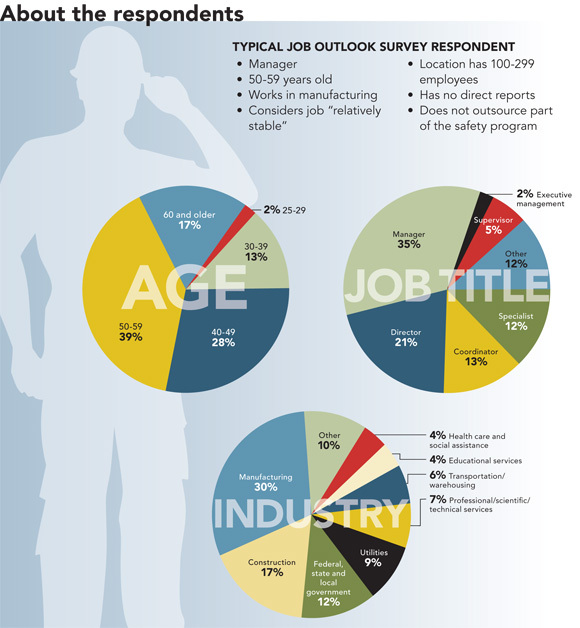 While the majority of respondents to the 2012 Job Outlook survey expressed confidence in their job security, 2 percent chose “I believe strongly I will lose my job” and an additional 11 percent indicated a “slight possibility” they will lose their job. Another theme that emerged in this year’s survey was putting off retirement. Among respondents who had planned to retire within the next five to 10 years, 44 percent said the economy has delayed their plans. One was a man who was laid off in 1999 after 30 years with an insurance company. The respondent, who is in his mid-60s, said he experienced age discrimination while looking for another job – one interviewer asked his age and others told him they wanted younger workers. A safety manager in the health care industry said he was nervous about losing his job because his employer was bought out by an investment firm and his group likely will be sold off, leaving him at the mercy of the acquiring company. Looking back, he expressed regret that he put off becoming a Certified Safety Professional because he did not expect to stay in safety. “If I had to do any one thing to shore up my hire-ability it would be the CSP designation,” he said. The construction site safety manager also listed actions he wished he had taken to improve his career prospects, such as taking professional development courses and networking with other safety professionals. “You have to prepare for the what-ifs,” he said, raising the following scenario: What if a safety professional has been doing the same thing at the same company for 10-20 years and suddenly has to find a new employer? “You’re going to be at a keen disadvantage,” he said. Faced with the possibility of having to find a new job, he is considering leaving construction or even switching professions. *Names withheld to allow respondents to speak openly about their job situation.